The restoration of Time Vault led to a reckoning in Vintage, with a major mid-year restriction in 2009. The correction produced a metagame that was visibly diverse and interesting all the while new strategies gradually emerged and improved themselves by assimilating new printings and tactics. Witness how Conflux and Alara Reborn nudged the great Schools of Magic forward, while Zendikar fundamentally transformed the possibilities and tactical dimensions of the format. 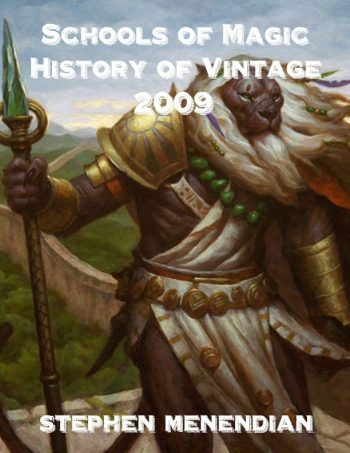 Read about all of this and more in this installment of the History of Vintage! The 50th Magic expansion set, Zendikar was released at the beginning of October. This set was a monumental milestone. To promote the theme of Zendikar (“Deadly Perils, Priceless Treasures” ), the first print run of Zendikar boxes contained randomly inserted “priceless treasures,” including cards from Alpha to Urza’s block. But in practice, Zendikar featured its own priceless treasures for the Vintage format, offering arguably the most Vintage playables since Future Sight. First and foremost, Zendikar introduced the long anticipated enemy fetchlands, including Misty Rainforest, Scalding Tarn, Arid Mesa, Verdant Catacombs, and Marsh Flats. Enemy fetchlands were eagerly anticipated to perfect basic land consistency for blue-red or white-black decks. This cycle of cards alone would have made Zendikar one of the most important sets in the history of the format. But Zendikar included so much more than that, starting with one of the most important counterspell printings in the history of the format: Spell Pierce. For as long as anyone can remember, Type I and Vintage deck space was amply filled with two casting cost counterspells. This continued to be true well in to 2009, as we saw from the dominance of Mana Drain decks earlier in the year. Spell Pierce was the first truly high value one mana counterspell. As I said in my set review, “Spell Snare and Force Spike are too conditional for Vintage but this card’s conditionality – the fact that it can’t counter creatures – is negligible in Vintage even though it makes it much worse in other formats.” Spell Pierce would forever change the blue mirror match. One of the cycles in this set was a set of “Traps,” cards that could be played under certain conditions for no mana. Mindbreak Trap and Ravenous Trap immediately excited players, and have stood the test of time and are still staples of the format. One of the central keyword mechanics for the set was Landfall, a trigger that occurs whenever a player plays a land. One of the marquee cards in the set was Lotus Cobra, which generates mana of any color with a land trigger, and would eventually see some Vintage play. More importantly, however, was another new tactic for Dredge.